I’m delighted to re-blog this lovely review of The Drago Tree. Elizabeth Jane Corbett writes: – “Book one on my list (yes, a two book week) was, Isobel Blackthorn’s, The Drago Tree. Being published by Odyssey Books, a small brave, independent press giving opportunities to emerging writers, would have put this title high my list. But, actually, the content of the story proved the ultimate qualifier. Set on the tiny island of Lanzarote, it tells the story of Ann Salter, a middle aged geologist fleeing her failed marriage, Richard a popular crime novelist plundering the island for his stories, and, Domingo, the indigenous potter whose love for the land goes beyond the shallow financial gains of western tourism. As the three explore the island, aspirations and tensions, undermine their friendship. The result, a reflection on artistic integrity, relationships, and ultimately our responsibility towards the environment. Thank you Elizabeth!! 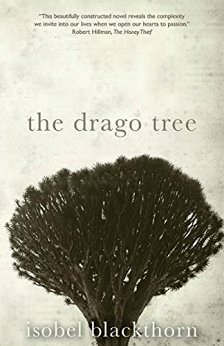 The Drago Tree can be purchased @ Amazon and through all good booksellers. Next Post Celebratory book sale of The Drago Tree! !